Canon has brought out the big (but compact) guns in the Canon PowerShot G1 X. While it may look like a point-and-shoot camera it nonetheless packs a real punch under the hood. Its huge sensor measures 18.7x14mm, which is larger then the Micro Four-Thirds sensor and nearly as big as the APS-C sensors found in some DSLRs (22.3 x 14.9 mm for Canon). What sets the G1 X apart from those types of cameras is that it doesn’t have an interchangeable lens – you get the 4x built in lens, covering the 28mm-112mm range in 35mm equivalent with a maximum aperture of F/2.8-F/5.6 and that’s that. This does have the upside of making the camera more compact – the camera measures 116.7 x 80.5 x 64.7 mm and weighs 534g. 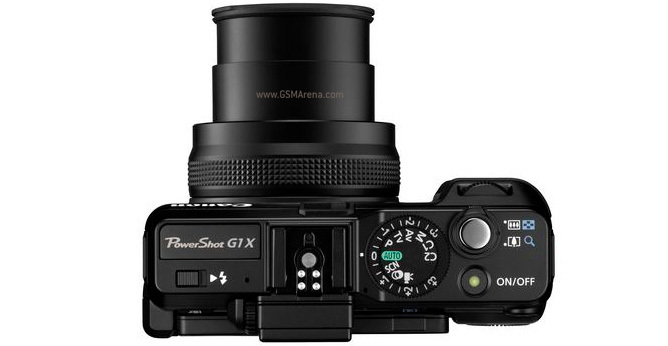 Anyway, other salient specs on the PowerShot G1 X that camera geeks will enjoy are the 14.3MP resolution, ISO that goes up to 12800 and 14-bit RAW images. There’s a built-in ND filter and an HDR shooting mode, too. You also get a Mode Dial and a Front Dial for better control of the shooting process. The G1 X is compatible with hot-shoe accessories like the Speedlite, Macro Twin Lite or the Macro Ring Light flashes. For setting up the shot, you can rely on the swivel 3″ LCD display with 922K dot resolution. The Canon PowerShot G1 X is good for videos too, not just still shots – it can shoot 1080p@24fps videos too. A quick note on the sensor – DP Review have prepared a handy illustration that shows the size of the G1 X sensor relative to other sensors. The Canon PowerShot G1 X will sell for $800 starting next month.